In preparation for your wedding, one of the things you have to do is to choose and purchase a wedding ring. But what type of material is best for the wedding bands? Years ago, the traditional choice for a wedding ring and engagement ring was gold. Although it’s still popular today, there have been various other types of metals that are now widely used, giving more choices for wedding and proposal ring. Here are the most popular wedding ring materials used by couples. The most popular material used as wedding bands. This is also a good choice for an engagement ring. There are various shades of gold to choose from, such as white, green or rose. This metal is measured in karats, with the purest that measures 24 karats. However, jewellers don’t advice to mould rings in purest gold because it may deform due to its malleability and softness. Mixing it with other metal, like silver, would be best to add strength and durability to the wedding rings. Tungsten is one of the popular choices for men’s ring in Singapore. This metal doesn’t require much maintenance and known for its ability to tolerate rough handling. Also, wedding bands made with this material is much heavier than any other type of band. Tungsten is a thick and heavy metal, which represents masculinity. 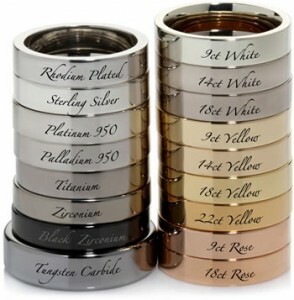 Furthermore, tungsten rings are stronger compared to gold, which gets softer over years. Platinum is a rare and eye-catching metal that has been commonly used in jewellery and even reputable stores over the past centuries. It has white lustre that shines that you can get in wedding bands by ling jewellery from Singapore and does not easily fade or tarnish. The durability of this metal will also give you the confidence to wear the ring for years without worrying about discoloration and scratches. Moreover, platinum rings are hypoallergenic. Therefore, this material is ideal for people with sensitive skins. Palladium has been around for years, but because of difficulties with moulding, it has only recently been used in jewelleries. It is a silvery-white metal that belongs in the family of platinum. Like platinum, it is hypoallergenic and doesn’t easily tarnish. Furthermore, it costs significantly less compared to platinum. Titanium is another type of material popularly used in wedding rings in Singapore. This metal has the same durability with platinum, but with very light weight. Furthermore, Titanium allows you to add unique and creative ring. For instance, a plain titanium ring can have gold inlay, but it can also have Tiger’s Eye, opal, or Koa wood inlay. Titanium bands with inlays are preferred by many couples because they come in various designs that are stylish and unique than the traditional gold wedding band. Silver ring is a cost-efficient alternative to traditional wedding ring materials. These rings are usually set with a cubic zirconia instead of a diamond stone, which means that a wedding band set can only cost you as little as $30. Moreover, silver rings are coated with rhodium, which fades over time and requires re-coating to renew its beauty. This entry was posted on Wednesday, November 20th, 2013 at 7:00 am by Editor	and is filed under Wedding Tips. You can follow any responses to this entry through the RSS 2.0 feed. You can skip to the end and leave a response. Pinging is currently not allowed.